Learn how to troubleshoot the bank feed when your bank transactions are no longer coming in as expected. Sometimes bank feeds needs to be re-authorized, which simply means you need to enter your credentials again. 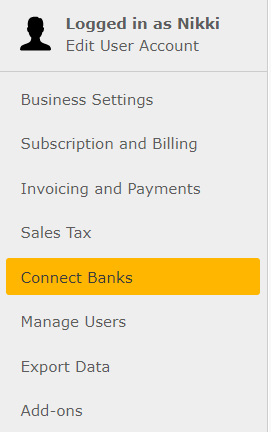 To do this, go to the Bank Feeds page in the Settings area. There you'll see all your bank feed connections. You can click the Refresh button next to your feeds if the Last Refresh date isn't current. If you need to re-authenticate the feed, you will see an exclamation mark beside the connection. To re-authenticate, all you need to do is click on the Edit button and re-enter your credentials. If the re-authentication is successful, transactions will resume importing into the Banking page. You may need to wait 24 hours before transactions start to import. Locate the feed with an issue and click on the Remove link. When you re-add a bank feed, duplicate transactions may be imported for the last 90 days into the Banking page. If this happens, there is a link near the top of the page that you can click on to remove all unmatched rows, as seen below. Note: It is critical that you match/add all the income and expenses you need before you bulk remove duplicates. The above option will remove all unmatched rows. However, if you only want to remove a single imported transaction, you can use the Remove from Bank Statement checkbox found next to it.